All photos in this post were taken by me, unless stated otherwise. On October 12, 2017 my husband and I said our “I Do’s” in beautiful Italy. It was a week-long adventure with family and friends and it was perfect. We stayed at the beautiful le Torri di Bagnara in Umbria. During the days leading up to the wedding our guests were encouraged to explore Italy, from Rome to Florence. To read about the day trips my husband and I took during our stay, check out my blog posts on visiting Gubbio, Assisi, and the Perugia Chocolate Festival. My husband proposed while we were in Rome for Christmas. I was in my last year of law school, one semester to go, and still had to study for and take the Texas Bar Exam in the summer. We knew it would be a long engagement because there was no way I was planning a wedding while studying for the Bar. So, in August 2016 we started searching possible destinations for our wedding. That was difficult. We wanted a location far enough so that people would understand why we invited a small number of guests, but close enough so that our guest-wish-list could attend. That leaves you with a lot of possibilities. My husband wanted a beach location. My skin and hair don’t do well with humidity or wind so I was looking for something more inland. I did consider locations with beaches such as Hawaii (my sister lives on Oahu), Brazil, and the Caribbean. Since the Spring was too soon, there was a good chance our wedding would be during Hurricane season so the Caribbean was crossed off our list of possibilities (and 2017 was a horrific year for hurricanes). I also looked at New Zealand because we have never been. But most locations (unless it was on a mountain) looked like Colorado. I moved on to considering the Mediterranean. Santorini was my first choice. It was on my bucket list of places to see and has an existing destination wedding market. As I looked at venues, every ceremony location looked exactly the same: patio with an archway overlooking the ocean. Even though I knew our portraits among the buildings would be stunning, I wanted something more unique for the ceremony. Santorini is also very expensive and our plan was to rent a house/villa/hotel rooms for our guests. Then I remembered where my husband wanted to propose. Remember how I said he proposed while we were in Rome? He kept insisting we take two days to visit the Amalfi Coast, just the two of us. But we were staying with my parents and I thought it would be rude if we left. Later he told me he wanted to propose at the Coast. Woops. To make it up to him, I started looking at locations along the Amalfi Coast for our wedding. I found several villas that worked as both the location for the ceremony and where our guests could all stay under one roof. It was perfect. Until I looked at costs. But I fell in love with the idea of having the wedding in Italy. It became my primary focus. (By the way, my husband is still looking on his own time at other places, but I had more time on my hand since I took a break after the Bar.) The coast was too expensive so I started looking inland. The costs were cut in half! And there were so many villas to choose from that met our wishes. Italy also made sense. We had been several times and its were he proposed and had our rings made. Of course we should get married there, too! First we made a list of criteria to help narrow down our search process. We needed a place that could sleep at least 14 people (parents, siblings, us, our friend/officiant). The location needed to be secluded but close enough to towns for day trips. There needed to be a place for the dinner reception and the ceremony. And it had to be beautiful. We used several websites to find different villas that could possibly work as our wedding location: Homeaway and Luxury Retreats are the two we used the most. Once we had our list of places that met our criteria, we started making arrangements to visit each one. This is very important if you plan on having a destination wedding. Pictures can be misleading and you won’t know the surrounding area or understand the layout unless you see it in person. First, we mapped out the locations of each villa. This helped us understand where each one was in relation to one another and figure out where the nearest city was where we could stay during our reconnaissance trip. Second, we made appointments with each villa for a viewing. By the time we figured out where we wanted our wedding it was November, so we planned to do a last minute trip to Italy right before Christmas. Fares were cheap because of the season and sometimes you get lucky with hotel rates when you book close to the day. We tried to book two villas per day during our week-long trip. And attempted to book villas that were close to each other on the same day. Third, we booked our hotel rooms and flights. We stayed in Perugia for the first few days, then stayed in Sienna for the remainder of the week. Fourth, we rented a car and my husband got an international driver’s permit (just in case). The villas were spread out and the only way to reach most of them was by car. It was cheaper and gave us more freedom to have a car of our own. Last, we took a tour each villa. We were able to narrow our list down from 6 to three while we were in Italy. On our first day of touring we visited a rustic Castle that was extremely secluded and cozy, and owned by a Napoleon descendant. It was a contender. The next was the place we eventually chose. The next day we drove from Perugia to outside of Florence to tour a villa located in the Tuscan hills. The location was amazing, but the villa itself was a little odd. Some of the rooms were behind a hidden door and the layout was a little confusing. And though the rooms were huge, the living spaces felt cramped. Not ideal for 14+ people for a week. But its location and garden was enough to keep it on the list. We moved on to Sienna and toured three more locations: two of which were a bust. The last villa was amazing: espresso bar, observatory, pools, movie room, beautiful rooms and architecture. But so not in our budget. Note: If you plan on getting married in Italy, you need to chose a location that is authorized by the government to host a wedding ceremony. When we got back to Texas we spent Christmas thinking over our options, making a list of pros and cons, and made our decision: Le Torri Di Bagnara. This was the easy part. We knew we wanted a date in the off-season: cooler weather, less tourists, lower prices. All we had to do was look at what dates were available and pick. Most villas require guests to rent a minimum number of days. Le Torri di Bagnara required a minimum stay of 1 week. The first week of the 2017 off-season was Saturday October 7th to Saturday the 14th. And that’s the week we chose. Then we had to pick a date for the ceremony. We decided on Thursday, October 12th. It gave our guests enough time to recover from jet lag, get to know each other before the big day, and gave our guests a day of rest after exploring during the week. For me, it gave me time to finalize little details, have a hair trial, and be rested before the big day. It also meant that everyone had one day to recover after the wedding (more specifically the reception) before having to fly home. We immediately fell in love as we toured the estate of le Torri di Bagnara. It met all of the criteria on our checklist and more. There are two buildings on the estate: the Castle and the Tower. Each room has its own unique design. The Castle rooms are named after the flowers used in the decor. Each room in the castle has its own bathroom, while the rooms in the Tower share a bathroom and living rooms space with a small kitchenette. The two buildings meant our guests would have plenty of personal space and places to relax if they didn’t feel like being around 20 people. The estate consists of 1,500 acres. This was important to us because it meant that our guests could stay at the villa if they wanted to, instead of venturing out for day trips, and not be bored. There is so much to do on the estate we could have stayed on site the entire week. From hiking to swimming to bocce ball, our guests were sure to be entertained (and they were). The owner of the estate (a descendant of Napoleon) gave us the grand tour and she was part of the reason we chose le Torri di Bagnara. Zenaide was lovely and assured us that she and her staff could help us with anything we or our guests needed. And she was right! From the best continental breakfast I’ve ever had to making sure our nephew had fresh milk everyday to celebrating with us at our wedding reception, the staff was truly a pleasure to be around and extremely helpful. To learn more about Le Torri di Bagnara, click here to view their website. We rented the villa through Luxury Retreats, a full service rental company. The company offers a selection of over 4,000 luxury villas in more than 100 destinations around the world, from United States to Italy to Indonesia. With every rental, guests receive support from a 24/7 concierge to help plan their perfect vacation. We arranged all the details for our stay at the villa through Luxury Retreats. There was one concierge helping us with payments and another helping with day trips and anything else our guests needed for the week. The concierge helped us assign our guests to specific rooms (friends stayed in the Tower and family in the Castle) and took care of groceries upon our arrival. During our stay we had 2 dinners prepared by the onsite chef. Each dinner was hosted by one of our guests, and these menus were planned using Luxury Retreats. Using the services Luxury Retreats provided made not only our stay at the villa extremely easy, but also our wedding as stress free as possible. Here is the link on Luxury Retreat’s website for Le Torri di Bagnara. To plan your next luxury vacation, click here and start browsing Luxury Retreats’ villas. Our plan for our destination wedding was to make it a vacation for everyone. That meant a week-long stay at our wedding venue. We decided to pay for the entire estate ourselves to help ease the burden on our guests of paying for a week-long trip over seas. We also helped several of our guests score some great deals on flights (which is our method of purchasing airline tickets). During the week our guests planned their own day trips, meals, etc. Then we would all gather at the villa in the evenings for dinner, drinks, games, and a lot of laughs. For more about our Life in Luxury, check out my blog post here! To read more about the day trips my husband and I went on during our destination wedding week, check out my posts on Gubbio, Assisi, and Perugia. Follow me on Instagram (@laura_en_route) for more photos from our time at an Italian castle! All of the photos below were taken by our wedding photographer, Jules Bower. If you are a hands-on bride, a “control freak”, or have a plan for every detail you could possibly imagine for your wedding, then doing a destination wedding may not be right for you. Or, it’ll just be a difficult process. But, if you’re more care-free about all the details, then you’ll love planning destination wedding. When people found out we were getting married in Italy they usually asked how hard it was to plan something so far away. They were surprised to find out that it wasn’t difficult at all. We planned both the wedding in Italy and a reception back home in Texas. Between the two, the reception was by far more tedious to organize. I highly recommend doing a destination wedding (and only that if you can get away with it)! 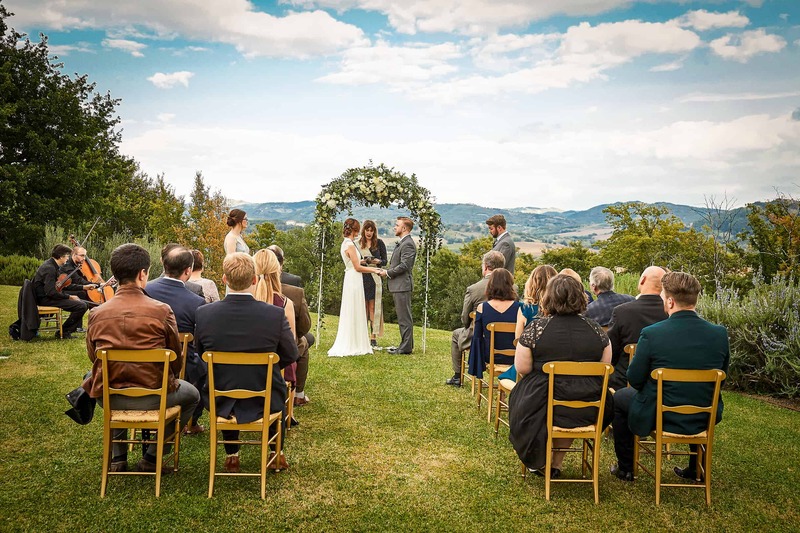 Since le Torri di Bagnara is authorized to celebrate legally valid marriages, it comes fully equipped to host a wedding ceremony. Not only are there plenty of location options on the estate (two castles, a chapel, and 1,500 acres to chose from), but the staff is prepared to fulfill your wedding dreams. Note: Many vendors prefer or require payment in cash on the wedding day. Be prepared! The owner, Zenaide, quickly put me in touch with their wedding planner, Fabrizio. He was amazing! With the time difference, email was the most viable way for us to communicate. This requires a bride to be patient, as it may take a few days to receive a response. But, with all of the documents we needed to review or sign, email was the best option. Fabrizio would let us know when we needed to make payments or certain decisions and I never needed to stress about what needs to be done next. I just waited for an email letting me know. The best part, to me, about having a wedding planner abroad was having very few decisions to make on my own. Not only that, but when a decision needed to be made, I only had a small number of options to chose from. I was given 4 suggestions for photographers and told who would be my makeup artist. I had to option to look elsewhere, but I trusted the opinion on someone working for a luxury castle in Italy to decide what vendors would be best. For flowers and other decor, I emailed some photos I found on Pinterest with a short description of what I was looking for, and Fabrizio did the rest. I didn’t have to decide napkins, plates, chairs, menu cards, table seating, etc. I loved not having to fret over the little things. The villa has a set menu for weddings. All we had to decide from a short list of options was: main course, first and second course, hours for bar service, and timing for speeches, cake cutting, and cocktail hour. Everything was delicious, too. The chef prepared a gluten free meal for my dad, altered the traditional wedding cake to include chocolate, and the portions were perfect. Not only was there wedding cake, but a dessert bar as well. I wish we could have taken home the left overs! Fabrizio was there on the day of the wedding to make sure everything went smoothly. If he had any questions he went to the groom. I also had a friend who was eager to help so we assigned her to relay any messages Fabrizio had for me. Both my sister and I were able to relax and do absolutely nothing on the day. Our wedding planner, Fabrizio, suggest Elena Pontoriero for my hair and makeup artist. I went to her Facebook page, browsed through her portfolio, and liked what I saw. She had several examples of natural looks that I liked so I knew she would be more than capable of creating the look I wanted for my wedding day. Fabrizio gave me Elena’s email and I contacted her directly to make all the arrangements. I shared some photos I had found on Pinterest for hair styles and makeup that I was thinking for myself and my sister (my one bridesmaid). We paid a deposit using a wire transfer and paid the balance in cash on the wedding day. My hair trial was the day before the wedding at the villa (I didn’t plan on going anywhere that day anyways), which meant I had amazing hair for our rehearsal dinner that night (she took the updo down and styled the remaining curls). Elena was extremely sweet. She brought an assistant with her to help with any translating, too. Both women were a joy to talk to and spend a few stress-free hours with on both days. They were also beautiful, which is a plus in a makeup/hairstylist. You can follow Elena on Facebook or on Instagram at @elena_pontoriero. to purchase this product using my Amazon affiliate link. I will receive a small commission if you purchase through this link, but your price will not be affected. Out of the four photographers our wedding planner suggested, we chose Jules Bower. As soon as mu husband started looking through Jules’s portfolio, he knew this was the photographer I preferred. His photography style matched what I imagined for our photos. Based on his portfolio, I could tell her understood light, landscapes, details, and had a way of making every bride look elegant. I’ll be honest, he was not the cheapest of the four photographer options. But he was worth the expense. We wanted photos we would cherish for life and if we had to pay extra to get what we wanted, then that’s what we were willing to do. Not everyone has the luxury to prioritize this expense, so if you’re planning a destination wedding, be prepared for sticker shock when finding a photographer. He was also blunt and very detailed oriented. This was fine with me because it meant he was a perfectionist and willing to do what was necessary for a great photo. When planning a wedding (destination or at-home) make sure your personality meshes with your photographer! You’ll be spending a lot of time with him/her on your wedding day, so its important you get along. To find our more about Jules Bower and see his portfolio of fabulous Italian weddings, visit his website, here. Tip: If you’re thinking about having a destination wedding in Italy, check out Jules Bower’s portfolio for ideas on other amazing locations across the country! All I had to do for my flower arrangements for the ceremony and the reception was to share some photos I found on Pinterest to my wedding planner, Fabrizio. I requested simple boutonnieres for my husband and his brother and suggested using olive branches. For my sister, I requested a corsage instead of a bouquet. I figured we wouldn’t be able to bring any of the flowers home with us (unless we spent a lot to have them shipped) so it seemed like a waste of money and flowers to have two bouquets. Also, I didn’t want my sister to have to stand beside me holding two bouquets during the ceremony. If she had, she wouldn’t have had any free hands to dry her tears! I thought the corsage worked out wonderfully. Then again, I’m biased. For my bouquet, I sent a few photos from Pinterest with flowers and colors that I liked and Fabrizio responded with a photo that I absolutely loved. I have no idea if the photos were from the florist he worked with or somewhere else, but i loved his suggestion. My bouquet is very similar to the one he showed me. I wish I could have saved it. He also showed me an idea for a table runner made of greenery and it was…okay. But the final result was beautiful. Fabrizio and his staff did a wonderful job. Our wedding day was perfect and stress-free. Everything turned out beautiful and better than we could have hoped for. The day didn’t fly by as it usually does for most brides since we woke up on location surrounded by our guests and were able to stay up until 2 AM dancing, drinking, talking and simply walk to our rooms. Then in the morning we had breakfast with our guests and went to a chocolate festival! Our wedding felt like a week-long rather than a few short hours. If you’re able to have a destination wedding, I highly suggest it! Are you planning a destination wedding? Did you get married abroad? Share your questions, locations, tips and more in the comments!